Preparing for print a selection of my psychology sketchnotes for my Patreon subscribers each month has been a fun experiment as I sort through sketchnotes old and new and learn the in’s and out’s of the best way to convert doodled sketchnotes to print-ready worksheets. This month I included in the PDFs this page of notes from my course on leading and facilitating therapy groups, taken during the summer of 2017. This was an interesting course, as much of the course time was reserved for immersive learning- i.e. rather than lectures the bulk of the 3-hour course was spent in what Group Therapy theorist Irvin Yalom calls a “T group.” In the in-class group we processed process- that is, how we engaged one another and how we ourselves were experienced by the group. It was an intense experience, to say the least, and an experience in group that lectures could not have taught. 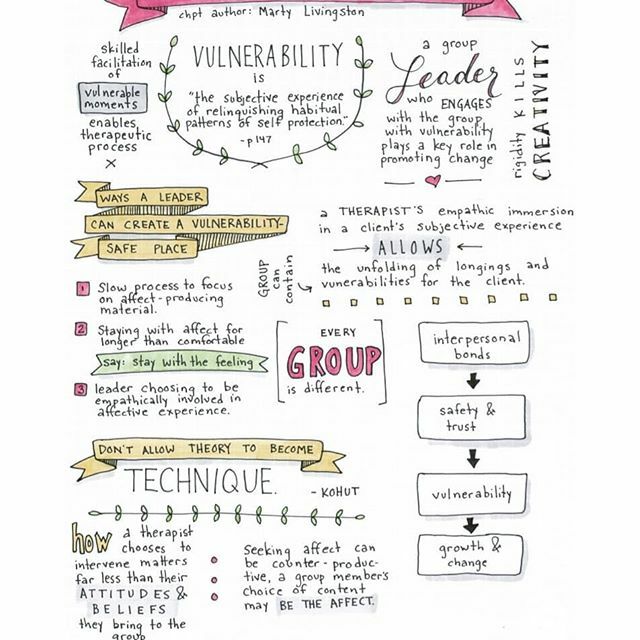 It emphasized, like the sketchnotes below, how vulnerability isn’t about sharing personal things (in the case of T-groups, we weren’t allowed to tell stories or talk about past experiences), it’s about doing the work within yourself to know the methods you use to protect yourself, and then choosing self-care (which includes boundaries) over self-protection. These notes are about group therapy leadership, but how might professional, political, or interest groups change if the leader slowed down the process, didn’t shy away from difficult moments, and set the example of empathy and emotional involvement? 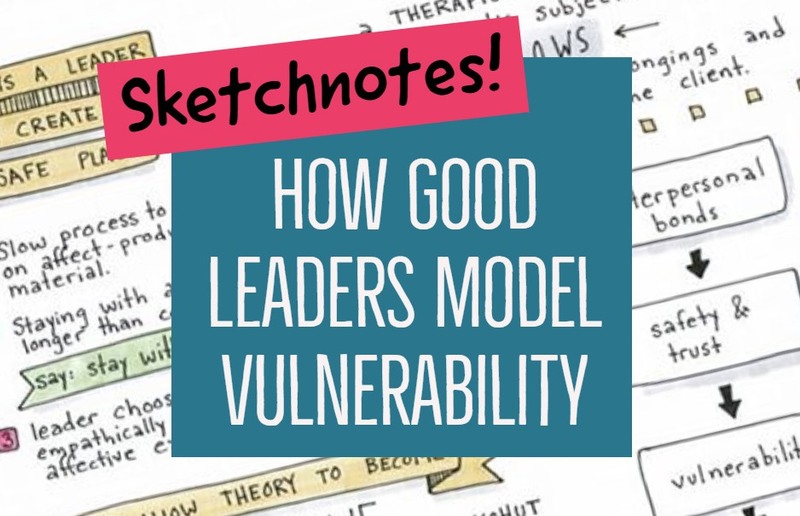 This sketch note on leadership and vulnerability can be downloaded in PDF format via Patreon. 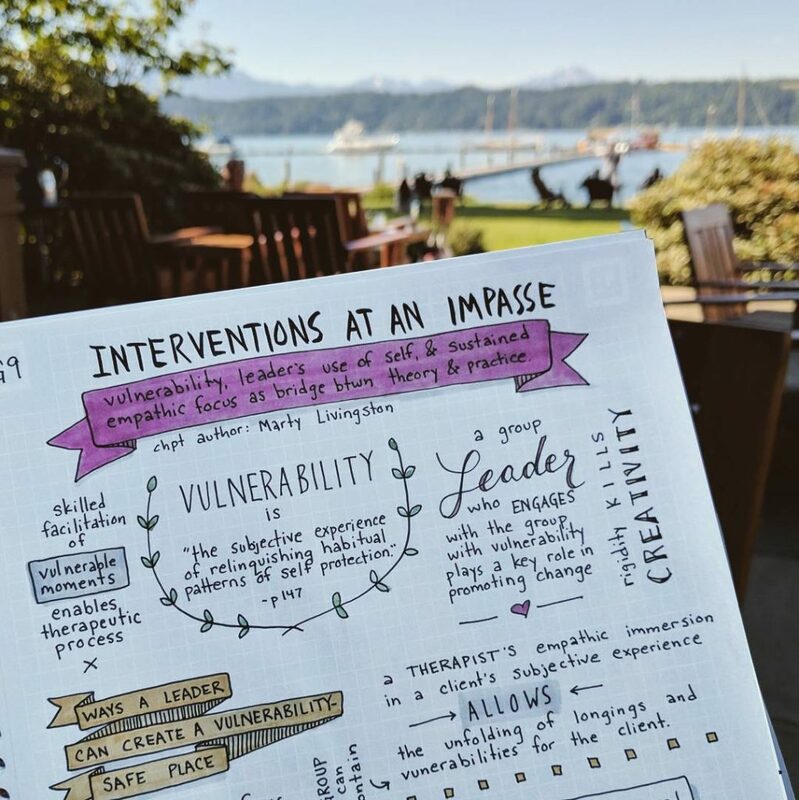 This is a bullet journal style sketch note of an article on group therapy. As part of my Master’s education, frequently professors required written chapter summaries as evidence that the required reading for the course had been completed. Most of the time the requirement was just for either bullet point style summaries or, for particularly important classes, “responses” or reflective questions we had based upon the reading. This is an example of a sketch note I took for one of these required readings. I learn better when I represent information visually, and so even though it took a little longer I often felt the information was important enough to do the long-hand format effort to commit this information into my memory. Pen and paper helps us remember information better because of the brain processes involved in putting pen to page. As a visual thinker, it also helps me organize my thoughts and recall information when needed. Skilled facilitation of vulnerable moments “in a group therapy group” enables the therapeutic process. A group leader who engages with the group with vulnerability plays a key role in promoting change. A therapist’s empathic immersion in the client’s subjective experience allows the unfolding of longings and vulnerabilities for the client. interpersonal bonds create safety and trust. Safety and trust create vulnerability. Vulnerability creates growth and change. how a therapist chooses to intervene matters far less than their attitudes and beliefs that they bring to the group. Intentionally seeking affect can be counterproductive to a group, the content that a group member chooses may actually be the affect. As a doodle these notes I thought about not only the process group that I was a part of alongside taking this course in group therapy, but I also thought about the narrative therapy and recovery groups I’ve been a part of in the past and about organizations I have been a part of in a professional and nonprofit sectors. Although these rules are about group therapy and group therapy leadership, the rules seem to apply widely. – Every group is different, relationships build trust which builds vulnerability which helps people change, the rules don’t have to inform every exchange we have, how we engage is more important than what we say, and being a leader who engages with vulnerability will lead a group – be it a work force, sports team, or a family – into more vulnerable relationships. Are you interested in a printable PDF versions of this page of sketchnotes? Check out the Patreon link below.